If you read my other blog you know that I am trying to reduce the size of my booty, and most other things on me, too. Ok, never mind. I would like to keep my big booty, big chest and big hair, but the rest of me can shrink a bit, thank you. Because I have been keeping track of calories, nutrition, etc, I have been eating more beans than normal, and normally I eat a lot of beans. Right now, the bean vehicle of choice is a black bean burrito in a low carb tortilla with onion. It doesn’t sound great, but it tastes pretty wonderful. However, horror and damnation stuck two days ago when I went to make my precious bean burrito and I was out of tortillas!! The horror! The insanity! The wailing and gnashing of teeth! Ph'nglui mglw'nafh Cthulhu R'lyeh wgah'nagl fhtagn!!! 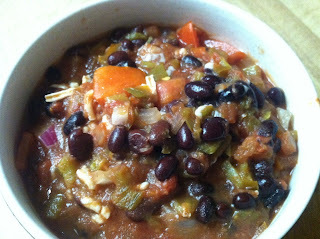 Combine the black beans, salsa and green chilies in a small pot. Dice the tomatoes and onion, then add. Simmer for about 5-10 minutes so the onion and tomato are slightly cooked. Remove and stir in the Daiya cheese. Divide into three bowls, about 1 cup each.